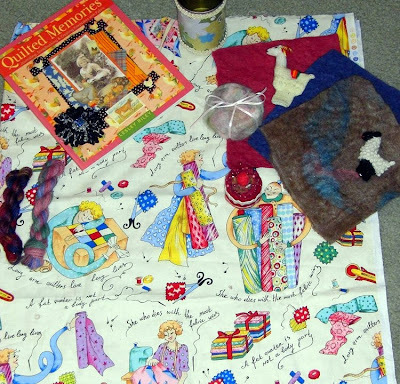 Gene Black an Alabama Artist and Quilter: What a STASH I got in the mail! What a STASH I got in the mail! I got a nice package in the mail today, while I was out "test-driving" a sewing machine (a machine that I can't even think about affording.) I did enter to win the machine though! Wish me luck. hosted a Gobs of Goodies giveaway. Guess which lucky old man won? That's right -I did! So I opened this lovely package today and found all sorts of treasures. 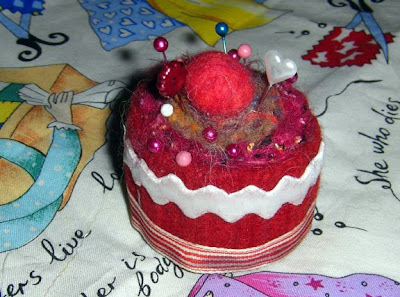 This adorable pincushion - with pins! Did you notice that round package on the felt squares? I didn't know what it was so I had to email and ask. OOOOoooh, I am so glad I did. I knew that it smells lovely. I was thinking a drawer sachet, but no. Even better, it is a bar of soap that is felted. You use it like a loofah. 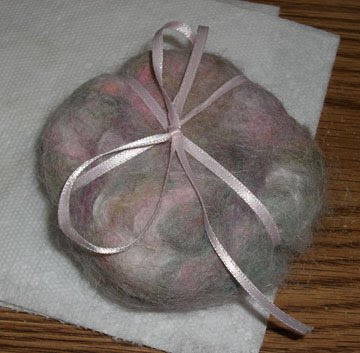 When the soap is gone, you can cut a hole and put more soap in OR use the felted wool as an embellishment for some other project. I am thinking that Linda should sell these. Also of note today, my friend, Kaye at NanaB follows NanaT is a doing a giveaway as part of the Eggstra SpecialGive-a-Way you should go and comment to enter. Kaye is a wonderfully sweet lady and I am sure the prizes will be a delight. Good luck to you. I hear she is making some of the prizes. Handcrafted goodies are the BEST. OOOOOO...nice goodies in that package from Linda. I've seen photos on her blog of those alpacas and they seem really sweet. She has a LOT of them and she gave every single one of them a name...and she knows them all VERY well, too!!! Congrats on getting this nice giveaway package. I do sell those felted soaps, Gene! I even taught my husband how to make them. 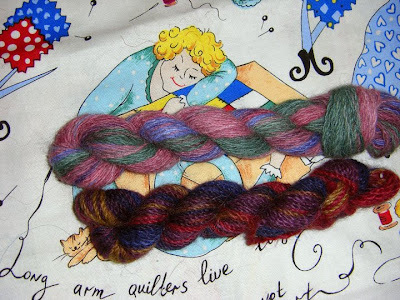 Well, he does the needle felting part and I finish it. After this show I'm doing, I'm going to re-open my Etsy store. Glad you are happy with the goods. Oh, and you can call me Buddy anytime. so you are the lucky one that won that...hummmmm Well..I am jealous but glad for you. Some really awesome goodies and you are right, she should sell those bars of soap. So how do ya make 'em ? What is that White stuff ?